Activity 1: Where are the EU Countries? Extension: Is the EU a federation or a confederation? Extension: What are International Organizations? Extension: What is Regional Integration? Extension: What is Multilateral Trade? Activity 4: The European Parliament – How does it work? On 29 October 2004, the Heads of State or Government of the then 25 Member States of the European Union signed the treaty establishing the European Constitution. From then until November 2006, the treaty on the European Constitution was supposed to be ratified by each of the Member States before it could come into force. However, referendums in both France and the Netherlands rejected the proposed constitution. Since all member states had to accept the constitution before it could come into effect, the process was aborted. The European Union continues to operate based on existing treaties which were most recently amended by the Lisbon Treaty which was ratified by the member states in 2009. Following the rejection of the Constitutional Treaty in France and the Netherlands, the German Presidency of the Council of the European Union tried to deal with the stand-still and made finding a solution to the constitutional crisis a priority. The Berlin Declaration was one attempt by the German Presidency to forge a path ahead for a united Europe. Germany also worked in cooperation with the subsequent presidencies of Portugal and Slovenia on this issue which was finally resolved with the signing and ratification of the Lisbon Treaty in 2009 (named after Lisbon, the capital of Portugal, where it was drafted during the Portuguese Presidency of the Council of the European Union). For more information on the Presidency of the Council of the European Union, click HERE. The set of fundamental rules governing the politics of a nation or subnational body. Read the definition HERE. Throughout the course of European integration, the European Union (and its precursor organisations) had never established a constitution. The Treaty establishing the European Community in March 1957, formed the basis of what has become the European Union. This treaty has been followed up by others, such as the Maastricht Treaty and the Amsterdam Treaty. However, this overlapping set of treaties make it difficult to distinguish between different decision-making roles, especially in an enlarged European Union. Establishing a constitution was the EU’s attempt to bring about more accountability and efficiency to its decision-making process. The most important impact of a constitution for the EU was that it could make the EU a legal entity. This has now been accomplished by the Lisbon Treaty. The proposed Constitution was based on the EU’s two primary existing treaties: the 1957 Treaties of Rome, the 1992 Maastricht Treaty and their amendments at the Treaty of Amsterdam (1997) and the Treaty of Nice (2000). The Lisbon Treaty: What is it? Unlike the constitution, which would have replaced all of the former treaties with a single document, the Lisbon Treaty simply amends the 1992 Maastricht Treaty and the 1957 Treaty of Rome. However, many of the same goals have still been achieved, giving the EU legal status and moving it forward so that it can evolve to accommodate additional new member states while becoming more efficient and democratic. However, like with the Constitutional Treaty, getting the Lisbon Treaty ratified was no easy task. Even though it was not going to replace the previous treaties like the Constitution would have, some countries still required a referendum before they would go ahead and ratify it. 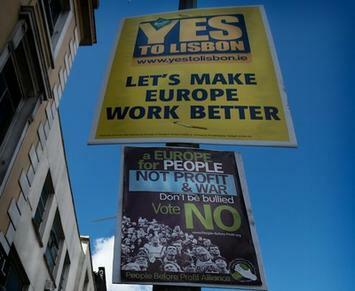 When Irish citizens went to vote for the Lisbon Treaty in 2008, they initially rejected it! People still had a number of concerns regarding the possibility of losing representation in the European Commission during certain years and being forced to make some changes to their national constitution. The European Commission responded by guaranteeing that each member state would have one Commissioner at all times and promised Ireland that certain parts of its constitution would not be affected by the Treaty. In October 2009 Irish Citizens were asked to vote for the Treaty again with these new promises from the European Union, and the Treaty was passed! Click here to see the website designed by the Irish Referendum Committee in 2009 to help citizens decide how to vote. Why is the Lisbon Treaty Important? What does it Change? The European Union is constantly changing and evolving. For example, new countries join the union, new policy areas are added and new agreements are made. As a result the EU also needs to undergo structural changes that will allow it to continue functioning effectively, efficiently, and democratically as it continues to grow and evolve. Even though the Constitution was rejected by EU citizens, the EU had undergone enough changes since its last treaty amendments that things still needed to be adjusted for it to continue functioning effectively as it continues to change and develop. The Lisbon Treaty was drafted to make these changes since the Constitution had not been able to. The biggest changes introduced by the Lisbon Treaty aim to make it more efficient now that it needs to operate with 27 individual and unique member states, increase the participation of EU citizens and to make it more democratic. As you have probably already learned in activity 3, the European Parliament is the only EU institution that is democratically elected by its citizens. This makes it very important in directly representing the interests of the people living in Europe. The Lisbon Treaty added many new policy areas to the list of those on which decisions are made by the co-decision procedure. This is the decision-making process that gives the European Parliament the most influence because it has equal decision making power with the European Council. In addition to adding new policy areas, the EU Parliament now also has increased power in determining the EU’s budget and international agreements. European Union citizens will now be able to send suggestions for new policy ideas or changes directly to the European Commission! A minimum of 1 million EU citizens from several EU countries must sign that they agree with the proposal and then the Commission will be forced to take it into consideration! With the ratification of the Lisbon Treaty, the EU’s Charter of Fundamental Rights finally becomes legally binding. This means that all of the rights included within it can be enforced by the European Union. 4. Introducing a new position: President of the Council of the European Union! The Presidency of the Council of the European Union rotates between the EU member states every six months. This means that it changes twice a year. Before, the meetings of the council were chaired by the head of state of the country that held the presidency. Now they will be chaired by the new president of the Council who will have this position for 2.5 years with the possibility of it being extended to 5 years. The EU hopes that because the person chairing these meetings will no longer be changing every six months, the European Council will have more consistency and be able to get things done more efficiently. 5. Introducing a new position: High Representative for the Union in Foreign Affairs and Security Policy! This person will also be the Vice-President of the European Commission and is supposed to be the person who represents the EU in international affairs and relations with other countries. This person is also in charge of coordinating the EU’s Common Foreign and Security Policy. Despite all of these changes that the European Union claims will make it better and more democratic, the Lisbon Treaty has been the centre of many debates between those people who support it and those who don’t. Vaclav Klaus, the former president of the Czech Republic was one of the more famous critics of the Treaty. Click here to read why he thinks the Lisbon Treaty is bad for the Czech Republic and bad for Europe. In Ireland, before the first referendum on the Lisbon Treaty in 2008, there was even a political party called Libertas formed to protest the Lisbon Treaty! Click here to read Irish voters’ reactions to the rejection of the Treaty in the first referendum. How did the process begin? Who were the main players in drafting the Constitution? What main changes will the Lisbon Treaty make to existing treaties? How would the Constitution benefit the EU? How does the Lisbon Treaty benefit the EU? How are the Constitution and the Lisbon Treaty different? How are they the same? In what ways will the Lisbon Treaty affect the daily lives of EU citizens? What are some arguments for and against the Lisbon Treaty? “EU summit braced for treaty rows”: from BBC news, 21 June 2007. “EU constitution ‘can be simple’ “: from BBC news, 14 June 2007. “Dutch Voters Reject European Union Charter”: from Fox News, 1 June 2005. “French say firm ‘No’ to EU Treaty”: from BBC news, 30 May 2005. “Chiraq Defends EU Constitution on TV”: from the Washington Post, 15 April 2005. “France names EU referendum date”: from BBC News 4 March 2005. “Danes set EU vote for September”: from BBC News 28 February 2005.